Angered by the arguments of a defense lawyer in court, a local Chinese political representative leapt out of his seat, beat up the attorney, got himself apprehended—and was almost immediately let off after he announced his political credentials. This bizarre incident took place at Chang’an District People’s Court in Xi’an, the capital of northwestern Chinese province Shaanxi on March 23, according to local newspaper Hua Shang Daily. Defense lawyer Lu Hang was in the middle of his defense statement when Lan Tian, Chang’an’s Communist Party representative to the National People’s Congress, suddenly got up from the spectator gallery where he was seated, charged at Lu, and landed the fierce punch. “I was merely making a case as a defense attorney when it was my turn to speak in court; who would have thought he’d rush forward to punch me,” Lu said in an interview with Hua Shang Daily. The lawyer was left with a 10 centimeter scar (about 4 inches) on his face and noticeable swelling on his forehead, and had to visit a hospital to receive treatment for his injuries. First, I’m unfamiliar with the law; second, I’m an irascible character; third, I don’t respect others … I request that you show understanding and forgiveness, and magnanimously forgive me. Lu Hang added: “In all my years as an attorney, I’ve never heard of any incident where a lawyer gets beaten up by an observer. I’m deeply troubled by what just transpired.” He later found out that his assailant had “beneficial ties” with one of the two groups in court; Lu was representing a real estate developer against a local construction company. Lan Tian the Party official was escorted out of the courthouse by bailiffs. When Lan found out that he was going to be detained for engaging in fisticuffs, he declared that he was in fact the city’s representative to China’s rubber stamp legislature, and showed the disbelieving bailiffs an official summons he had received to attend a session of the legislature in Beijing. The district court allowed Lan to leave the premises to retrieve his legislature representative identification, which he left at home. After Lan Tian returned with the proper document, the court ruled that it couldn’t detain the Party official without approval of the legislature’s standing committee. The following day, Lan Tian visited Lu Hang’s law firm to work out a settlement. Lu told Hua Shang Daily that Lan offered to buy him dinner, and gave him a handwritten apology. “First, I’m unfamiliar with the law; second, I’m an irascible character; third, I don’t respect others … I request that you show understanding and forgiveness, and magnanimously forgive me,” the letter read. A colleague of Lu said that Chang’an representative Lan had behaved in a brazen and dismissive manner at the law office. When a reporter from Hua Shang Daily called Lan Tian on March 25 to ask about the issue, Lan said he had reached an understanding with the lawyer, and that he had submitted the settlement documents to the Chang’an District People’s Court that day. He hung up before the reporter could fire off another question. “What does a representative to National People’s Congress represent? The representative represents privileges and arrogance,” wrote a netizen from Zhejiang. “Many representatives of the National People’s Congress and the Chinese People’s Political Consultative Conference are common thugs. Even if they aren’t thugs, they have ties to actual thugs. This is how China works; not worth getting worked up over it,” wrote a netizen from Beijing. “Does this representative dare to punch a lawyer if he were in a court in the United States,” queried a netizen “Tian Gang Tu Xiu” from Xinjiang. 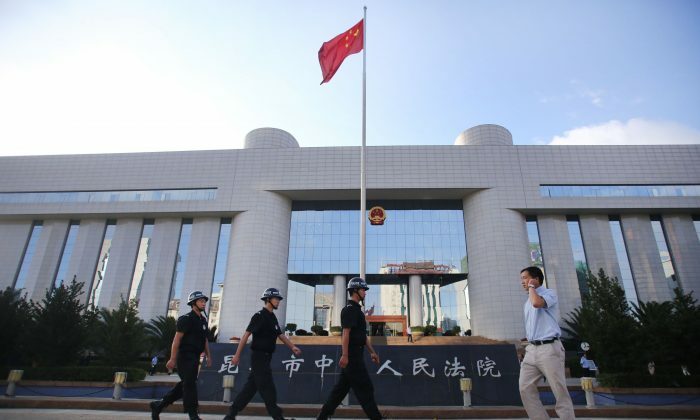 Where’s the Rule of Law in China’s Courts? In China, trials involving prisoners of conscience are little more than Kafkaesque exercises in authoritarian skulduggery.